What’s in store for the 13th annual Artisphere presented by TD Bank? 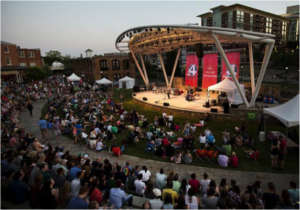 Organizers announced some of the exciting new “Don’t Miss!” programs for Greenville’s premier cultural celebration, May 12-14, and assured loyal patrons that festival favorites will be back as well. Artisphere 2017 will open with key festival supporters and civic leaders christening the roof of the new Embassy Suites River Place Downtown with the first strokes of a brush across what is to become a grand scale mural. The mural, designed and painted by artist, August Vernon, will take several months to complete, will feature Upstate landmarks and civic leaders and will be visible to guests from their hotel rooms and patrons of the rooftop venue. “The focal point of this piece will be the Liberty Bridge and Reedy Falls,” stated Bo Aughtry, Principal, Windsor Aughtry, “but will also include iconic buildings and natural landmarks like the Blue Ridge Mountains which can be seen, in real life, from the hotel. GE Artist Row will feature 135 artists selected by a panel of 5 jurors from a record high applicant pool of 1,136 (1 in 8 chance of acceptance). Forty-one of the 135 are first time exhibitors at Artisphere and seventeen are local artists. Two Emerging Festival Artists received scholarships to participate in this year’s show: Kiah Bellows (Painting) and Daniel Bare (Ceramics) will receive free booth space, mentoring and a professional photograph of their booth display. Each year Artisphere brings you new musical acts to 3 stages throughout the festival site and this year is no different. Brand new to Artisphere in 2017 are Smooth Hound Smith, The Ballroom Thieves and The Suffers who can all be found at the Greenville Spartanburg International Airport After Hours Concert Series on the WYFF-4 Main Stage. Other new bands include Soul Service (Greenville), Swim in the Wild (Charlotte), Grace Joyner (Charleston), and The Sofia Goodman Group (Nashville) to name just a few. There are over 48 performances throughout the 3-day weekend so come out and find your new favorite band! Festival goers will get the chance to make their own art at Artisphere 2017. The Furman Art Lab will feature 13 art making experiences for the 13th annual festival. These interactive demonstrations allow patrons to roll up their sleeves and flex their creative muscles with instruction by local artists including Izzy Mitchell and Heather Brame (collaging), Carol Funke (handmade paper), Joann Benzinger (photo image transfer) even a brand new plating demo with Chef Courtney McKnight of Plate 108. Participants will learn to prep garnishes and turn prepared food into a work of art using simple design techniques. The Art of Healthy Living Exhibit is a fun, interactive experience where children and families can learn about the health sciences and the importance of physical activity and good nutrition. Sponsored by the University of South Carolina–the state’s leader in health science education and research—kids can find out about a wide array of exciting health professions while engaging in hands-on activities designed to inspire creativity and learning. Activities will include SILENT DISCO, the most fun you have ever had without making noise, a portable ultrasound, and more fun and educational hands-on activities! 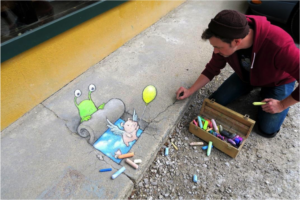 Illustrator and street artist David Zinn (Ann Arbor, Michigan) will be joining the festival to bring the streets to life with his whimsical characters and drawings. Zinn creates temporary street art composed entirely of chalk, charcoal and surrounding landscape features and is always improvised on location. Most of his drawings have appeared on sidewalks in Ann Arbor and elsewhere in Michigan, but some have surfaced as far away as subway platforms in Manhattan and construction debris in the Sonoran Desert. Zinn will create his own version of Greenville’s beloved “Mice on Main” (originally created by Jim Ryan, Zan Wells, and Linda Kelly). Also, new to the festival, is local artist Matt Gutierrez. Gutierrez, the creator of the chalk murals at Aloft Hotel in downtown Greenville, will make his Artisphere debut creating animated directional signage with chalk that guides you to your favorite festival spots like Art in Action, the Artists of the Upstate Exhibition and more. New (Not Yet Discovered) Upstate Chefs. The Greenville County School District Career Centers’ Culinary Program will be making its Culinary Arts Café debut. The school district’s four career centers allow students to prepare themselves for a career in the hospitality industry. Students learn everything from basic food prep techniques and food safety to nutritional menu planning and workplace management skills. The Donaldson Career Center and Golden Strip Career Center are teaming up to serve festive treats like street corn and bacon caramel popcorn. DRUM Percussion Studio and the Logos Theatre will be performing street parades throughout the festival weekend. Spanning the length of the festival twice a day on Saturday and Sunday with larger than life Chronicles of Narnia puppets, stilt walkers, and percussive accompaniments, these high spirited parades are sure to grab your attention. What’s Old is New to Artisphere. Visit the South Carolina Arts Commission tent to help them kick-off their 50th Anniversary celebration in the Upstate! Join the celebration with family-friendly activities. Bring your creativity and take part in a coloring contest for all ages, plus meet Arts Foundation members and Arts Commission staff. Crowd favorites are back by popular demand! Brian Olsen is back on the Wells Fargo and Real Op Investments Art in Action Stage for his 13th festival. The Metromont Community Sculpture returns for its second year on the Falls Park Amphitheatre. The Local Performing Arts Showcase will return to the WYFF-4 Main Stage Saturday and Sunday with performances from 11 different non-profit arts groups and SO much more!